Arcola, Albenga, Ortovero, Ranzo, Pornassio and Dolceacqua: 6 are the Towns of Wine in Liguria, flagstaff of a quality food and wine tourism, where the territory and wine merge and become one thing. 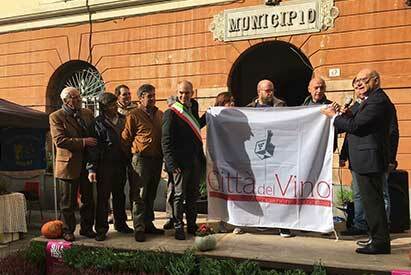 This is what happens in the six villages, where the unmistakable red flag on a white background – a prestigious award created by Associazione Nazionale città del Vino, in 1987 in Siena to re launch the image of Italian wine – flies like a proud banner. We will lead you to the discovery of these villages, starting from east and going towards west to find out more about their culture, nature and flavours. 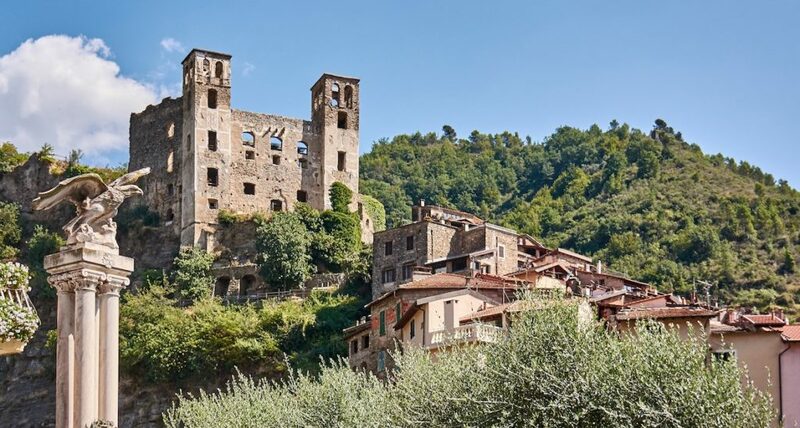 Our journey starts in Arcola, in the province of La Spezia, The village was an an ancient roman quarterdeck, with narrow paved streets, surrounded by chapels, sanctuaries and old windmills. The concentric streets in the historic centre lead to some charming religiuous and civil buildings, such as the pentagonal Obertenghi tower and the Castle that overlooks the whole Magra Valley, dotted with quiet hills, among vineyards and olive oil trees. On one of these hills, in Masignano stands Azienda Agricola Spagnoli, that produces a POD white wine and a red IPG wine. Our second stop is in Albenga, the last municipality that has obtained the flag City of Wine. This small town looks like a red island in the plain of the river Centa, thanks to the colour of the houses, churches and the monuments located in the historic centre. An ancient roman municipium that a had wealthy economic situation during the Reinessance. Albenga is well known for the remains of the city walls and the early Christian Baptistery, but this is not all. There are a lot of food and wine excellence: the purple asparagus, a Slow Food product, the archichoke from Albenga, the ox heart tomato, and the wines Vermentino, Rossese, Ormeasco, but most of all Pigato. It is a dry, fresh white wine, with strong flower and fruit aromas, its roots come from Salea, in the province of Albenga. 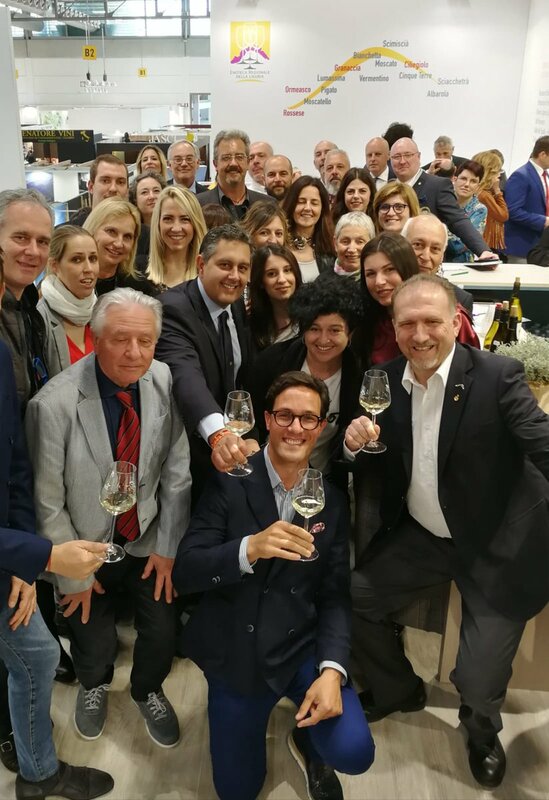 Among the wineries there is Azienda Agricola Enrico Dario, that has just won the prize “Premio Qualità Italia 2017” with its wine Pigato Superiore 2015 “U Baletta” Riviera Ligure di Ponente DPO. From the coast we go inland, at the border between Savona and Imperia, in the municipality of Arroscia Valley and we reach Ortovero, a quiet village surrounded by vegetation, located on the left bank of the river Arroscia, a real paradise for hikers, that can find here many cycle and foot paths. Ortovero is also the premises of Società Agricola Cooperativa Viticoltori Ingauni and Azienda Agricola Vitinicola Durin, an award winning winery of the Western coast. Ranzo is a small hamlet located in the middle of the Arroscia Valley, it stretches from the bottom of the valley towards the stream, among vinyards, olive groves, in a narrow stretch of land closed in, to the north by the mountains, and to the south by the sea. Olive growing flanked with grape vines, from which they make one of the most well known wines of Liguria: Pigato. Among the local farms there are: A Maccia, Alessandri Massimo, Bruna and Deperi. “Pornassio is the most amazing and original grape vine landscape that I have ever seen in my life” wrote Mario Soldati in “Vino al vino” in 1975. Pornassio is the fith stop of our must flavoured itinerary, it is a village located in the centre of the Arroscia Valley, there are historic and religious buildings, green stretch of land and thick woods are the setting of prestigious vineyards and great wines that go best with the local traditional dishes One above all is Omeasco di Pornassio, an intense red PDO wine that is similar to the typical Dolcetto from Piedmont. Our last stop is in Dolceacqua, a medioeval village located in Val di Nervia. Since 2011 as part of Città del Vino and the first in Liguria to obtain a PDO in 1972, the village stretches from the sea towards the Alps, among olive groves, vineyards, woods, rivers and streams, a bond of unequalled beauty. The village is also part of Città dell’Olio and is the premises of the National Association of the Orange Flag Countries. Dolceacqua has also become famous for the humpback bridge painted even by Claude Monet, the ancient Medieval Doria castle and the prestigious PDO Rossese from Dolceacqua. A ruby red wine, slightly garnet coloured, that has always accompanied the typical dishes of the local cuisine, such as “Rossese di Dolceacqua Terrabianca 2015” from Azienda Agricola Terre Bianche, one of the best Italian Wineries in 2017.